Much like in the real world, you’re not going to be very successful on StumbleUpon if you don’t build a network of contacts. The same holds true if you want to dramatically increase traffic to your website or blog from StumbleUpon. The more engaged relationships you build, the more traffic and engagement you will receive as a result of your hard work. This should be reiterated. You need to work hard to develop relationships. They take time to develop, so you shouldn’t expect to be an overnight success when building your StumbleUpon network. Give it some time, and you’ll see your website or blog traffic rise as a result of your efforts! The first thing you need to do is engage other Stumblers who are liking (and commenting on) content within your Interest categories. The best way to do this is to go to several pieces of content and find out who’s doing all this engaging. Sounds hard? Not if you know the tricks of the trade. 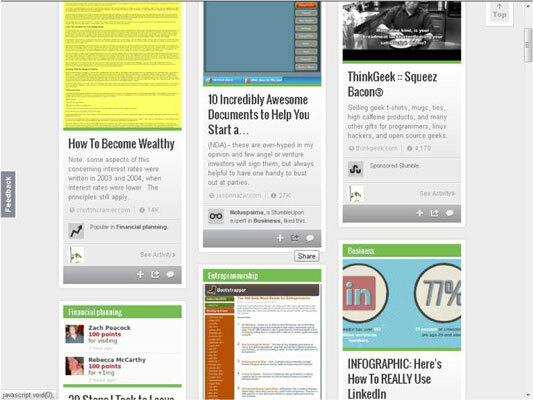 First, go to the StumbleUpon Home page and track down the Recommended Pages in Your Interests section. Pick a headline that interests you, and at the lower right of the widget, you see a small circular icon with an i in the middle. The number next to it represents the amount of StumbleUpon engagement on that piece of content. Click the icon and number. The next page displays a list of all the people who have liked that particular piece of content. Go ahead and follow all those Stumblers. Next, click Comments in the upper-middle portion of the page. This section displays a list of all the Stumblers who have left a comment on the piece of content. Because these Stumblers took the time to leave a comment, you should reasonably assume that they are a more engaged segment of your Interest category. Follow these Stumblers. Then, you want to put these Stumblers on a hot list of people to forge a relationship with. A simple Excel spreadsheet will suffice. Now, go back to the StumbleUpon Home page after you start getting notifications that Stumblers are following you back. Go to the Activity section of the Home page, and you’ll see all the latest activity from the new Stumblers that you have a loose relationship with. Now comes the hard part. It’s what separates the average Stumbler from the Superstar Stumbler. For one to three months, comment and like content that your fellow Stumblers are interacting with. In addition, share new content directly with your followers by clicking the Share icon — the square with an arrow going through it. Now here’s the kicker. Only share content with other Stumblers from other sources (not your original content) in the first one to three months. 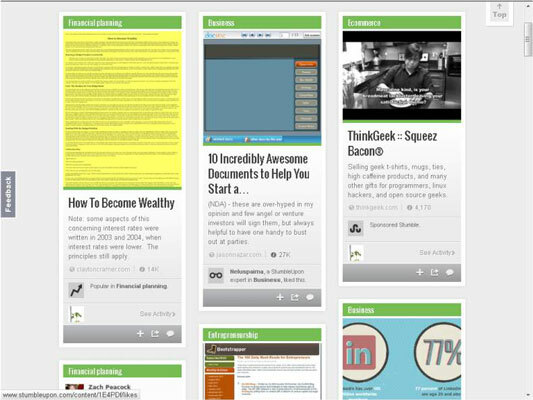 This tactic builds trust, as far too many people are only on StumbleUpon to promote their content from the beginning. Yes, promoting your content may be the eventual goal, but you have to create relationships first by helping others. The next tactic you can use is to message those Stumblers who are following you and you are following them. To see how this messaging would work, go to your Home page and then click the Profile link in the upper middle of the page. On your Profile page, click Followers below the StumbleUpon DNA section. You’ll see a list of the Stumblers that follow you. 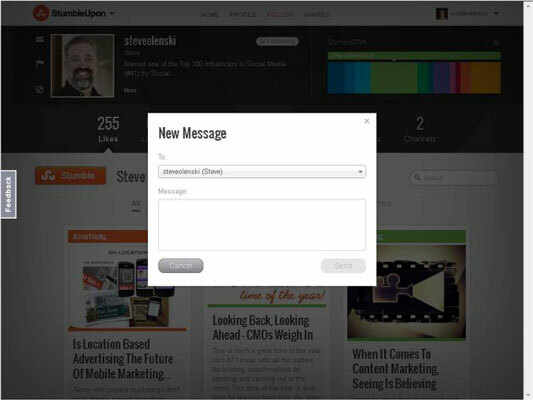 Click a Stumbler to whom you’d like to send a message. Doing so brings up the Profile page of that Stumbler. Look for the small envelope icon to the left of his or her profile picture. Click the icon, and a New Message box appears. Type a message in the Message field and click Send, and your outreach attempt of the day is sent on its merry way. When using e-mail, come up with a general template to send to your list. It outlines what the benefits are to the people who will be consuming your content. Remember to put the focus on how it will benefit them, whether it’s a new concept worth learning about or the fact that their audience will love the theme of the content. Messaging Stumblers where there is a reciprocal following relationship, meaning that you both follow each other, is the best way to directly ask others to Stumble your content. Finally, don’t forget about Paid Discovery.